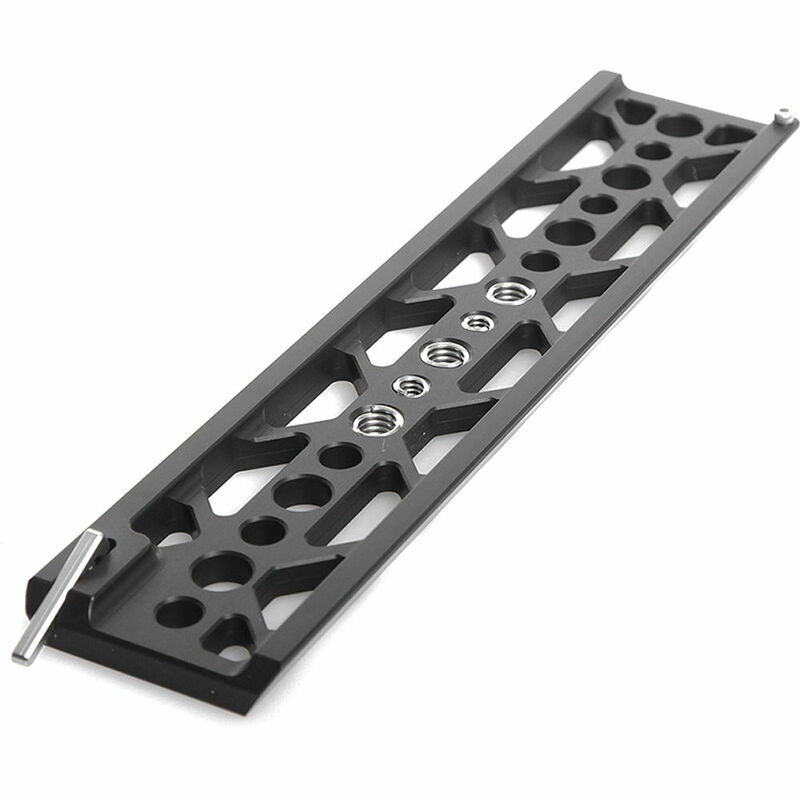 The Tilta 10” Lightweight Standard Dovetail Plate is compatible with other Tilta 15mm dovetail baseplates. It is made from aluminum alloy and stainless steel. Box Dimensions (LxWxH) 10.3 x 3.05 x 0.75"
10" Lightweight Standard Dovetail Plate is rated 3.8 out of 5 by 4. Rated 2 out of 5 by pedro from Well built, difficult to use. The system to mount and unmount the camera on this plate, using the other Tilta plate that goes on top is soooooo hard to make it work that I'm looking for another way to get this done. Rated 5 out of 5 by Ed from Lightweight Beast Built very well with strength while being lightweight, very precisely machined. Nice tool to have making the balancing of a camera easy. Rated 5 out of 5 by David from Very Light Nice addition for quick and easy dismount. How can I use my Tilta EVA1 rig with this dovetail? What modifications do I need to do? Asked by: John Mark P.
The Tilta Camera Rig for Panasonic EVA1 with Battery Plate B&amp;H # TIEST86 is meant only for a VCT14 plate such as this one: E-Image Quick-Release Tripod Adapter (VCT-14 Type) B&amp;H # EIPSC. Usually a video tripod has a little bit of back and forth for balance. However, it you have large lenses, you probably need a long plate like the Tilta 10 Lightweight Standard Dovetail Plate B&amp;H # TITTC16. In that case you might have to get something like the Tilta 19mm Baseplate / ARRI Standard Dovetail B&amp;H # TITTC06C07. This represents the clash of the industry standards, video with the VCT-1 and cinema with the ARRI 19mm Dovetail. You may have to decide at this point which side you are going with. What exactly would I need this for? Currently own the Tilta III DSLR Rig and I'm looking to swap out the current baseplate/dovetail/shoulder mount with the tilta a7s cage &amp; tilta offset shoulder pad. The cage looks like it comes with its own 1/4 mounts for QR plate and shoulder pad attaches via 15mm rods. So am I wrong to think that I will not need a dovetail plate? I wish to sell the current one that came with the DSLR Rig. You will not need the dovetail plate to add the ES-T16 to your existing DSLR rig. Just swap out the BS-T03 with the cage and add the offset Shoulder pad TT-0516.The Dovetail Plate can be used if you wish to add an extra degree of balance between your rig and the QR plate on your tripod head system. Is this doevetail compatible with the TILTA BS-T01 15mm Lightweight baseplate for RED WEAPON RAVEN SCARLET-W Camera Rig? We dont have these to test in-house, but based on our information, the TT-C16 should work, but the TT-C17 wont. How many mounting holes does it have? (3) 3/8 16, and (2) 1/4 20 re-enforced mounting screw receivers.